WataugaWatch: AppState to Bill Aceto: "Where's the Beef?" 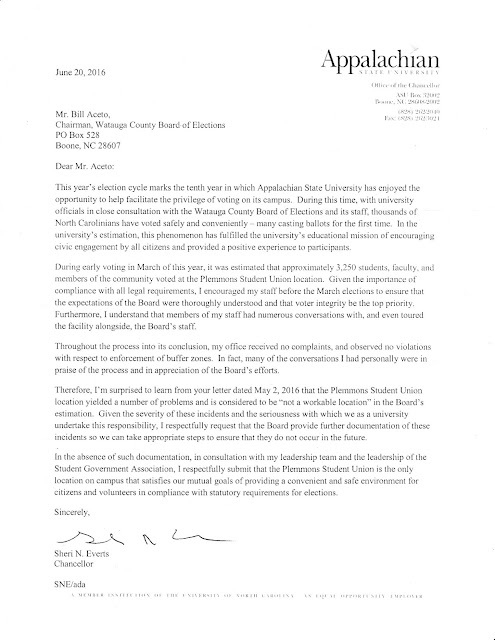 Recall that the Republican Chair of the Watauga County Board of Elections, Bill Aceto, wrote AppState Chancellor Sheri Everts a letter in May demanding that she not even consider suggesting the AppState Student Union as an Early Voting site this fall, because, according to Aceto, there were numerous complaints about that site. No such complaints have ever surfaced because no such complaints exist ... except in the minds of Bill Aceto and his political boss, County Attorney "Four" Eggers. Sheri Everts has now replied to Aceto's letter. The fourth paragraph is the important one (though the final paragraph ain't no slouch in throwing down the gauntlet). Translation: Put up or shut up about complaints about the Student Union as an Early Voting site. Bill Aceto's original letter was a bluff. Chancellor Sheri Everts has now called that bluff. Aceto and his fellow Republican Board member Nancy Owen will be under full public inspection when the Board of Elections meets on July 12 (5 p.m., in the Commissioners Boardroom) to approve an Early Voting plan for Watauga. Can we expect intransigence from Aceto on the subject of the ASU Student Union as an Early Voting site? You bet! Three cheers and 21 gun salute to Chancellor Everit! Mr. Ace to is a gutless wonder, a puppet. Bill considers his opinion to be "evidence." What do you want to bet he will just trot out his usual statements which have been disproved every single time since he took office. "Four" was in attendance during voting. And, was appropriately marched to the exit. I'm sure that was a source of some concern and complaint. After all, when the state board asked him what had changed since the original judge ruled that there had to be an early-voting site on campus (look at all the county people who work there and live in Deep Gap or Zionville and can't get home in time to vot!) and his response was that he 'disagreed with the judge's order'. Bill Aceto and his lot would send these self-same voters to Iraq to "bring democracy to the Middle East" while denying them their right to vote at home. These are the same people that insist on protecting the rights of terrorists to buy guns should they find themselves on American soil. Never will understand the mind of the Conservative voter. I have noticed that my comments on late term abortion have been deleted from the site. That's OK, I'm happy when the newspeak people are upset. However, today I don't have comments, only questions. Maybe Big Brother won't feel the need to send my questions down the hole. As I understand your argument we need to put a voting site on ASU campus because if it is at the Ag Center students will have to walk a couple of hundred yards to vote and they are to lazy to do that. Besides that they would have to walk next to a road and they are too stupid to stay out of traffic and might get run over. If those arguments hold water then what about the many senior citizen homes in Watauga County. These are citizens entitled to vote justas much as college students, and citizens who are truly unable to walk to a voting place. Shouldn't we put an early voting site in all the seniour citizen homes? For the same reason; what about the hospital. Shouldn't they have their voting site? What about the jail? The folks in the county jail are not all felons. In fact most are awaiting trial or are misdemeanants; elgible to vote. They can't get to a voting place because they are locked up. Shouldn't we give them their own voting place? Or is it only college students who normally vote democratic that we should pander to as the democrats suggest? I'm with Jerry W. in that I think we should make it easier for everyone to vote. That's why I oppose voter suppression (as in the case here) and why I support voting by mail and automatic voter registration like other states have so successfully done.